On January 20, 2017, when I was staying at my daughter’s place in Brooklyn, New York, I took a train to Valley Stream, walked a short way to a concrete-edged pond at Arthur J. Hendrickson Park, scanned carefully through 360 Canada Geese, 120 Mallards, and a sprinkling of other ducks, and found what I was looking for: my lifer Pink-footed Goose! Arthur J. Hendrickson Park’s name is bigger than the park itself — it’s not even mentioned in Kellye Rosenheim’s Birdwatching in New York City and on Long Island. I learned about the goose and found my way to it thanks to eBird. But how did that one lone goose from Iceland find its way to that tiny park? Vagrants — birds that wander beyond the limits of what we think of as their species’ natural range — can turn up almost anywhere. In January 2017, individual Pink-footed Geese, which mostly winter in northwest Europe, especially Ireland, Great Britain, the Netherlands, and western Denmark, had been seen in Nova Scotia, Maine, Massachusetts, Connecticut, New Jersey, Pennsylvania, and even British Columbia! Vagrant waterfowl can be drawn to areas teeming with wild birds, but no one knows exactly what sends them away from their natural range or what pulls them down in any given place. When they do find a particular spot that meets all their needs, they may stick around, but even that is hard to predict. 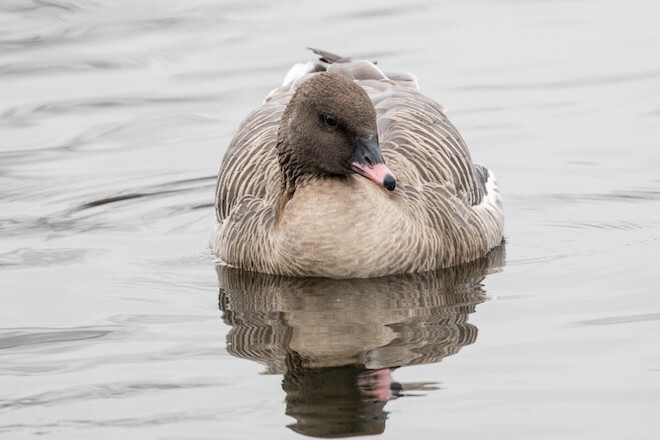 The Pink-footed Goose at Hendrickson Park was first reported on November 1, 2016, and it remained through at least February 22, 2017. In January 2015, a friend and I learned of an Ivory Gull from the far north being seen in Quincy, Illinois, and drove 550 miles south to see it. Unfortunately, it was last seen the evening before we arrived. On New Year’s Day 2016, an Ivory Gull turned up in Duluth, Minnesota, my own city, at a popular gull-watching spot where it was very easy to see. That one remained for over three weeks; I saw it many times. One vagrant turned up three winters in a row in my neighborhood. A Golden-crowned Sparrow from the far West showed up at a friend’s feeder in November 2014 and remained until January 2015. The same bird returned in November 2015 and November 2016. I live just a few blocks away and yearned to entice the little guy to my yard at least once, but without luck. In a neighborhood teeming with bird-feeding stations, it visits just one. I was the lucky one on November 16, 2004, when a Rufous Hummingbird turned up in my backyard and stuck around for over two weeks. Hundreds of birders saw it. Discovering a vagrant anywhere is like winning the lottery. But unlike lotto winnings, which can be squandered in short order, we can share our birding winnings with others, and that tick on our life list or yard list will last forever. This article from Laura Erickson’s column “Attracting Birds” appeared in the May/June 2017 issue of BirdWatching magazine. One of the best ways to see birds up close. In Peru, bird-feeding stations are helping to protect habitat. Four major threats to birds may lurk in your yard. How Red-bellied Woodpeckers turned a bad spot into a good nest. Feeding birds entails serious responsibilities. Laura Erickson is the 2014 recipient of the American Birding Association’s highest honor, the Roger Tory Peterson Award. 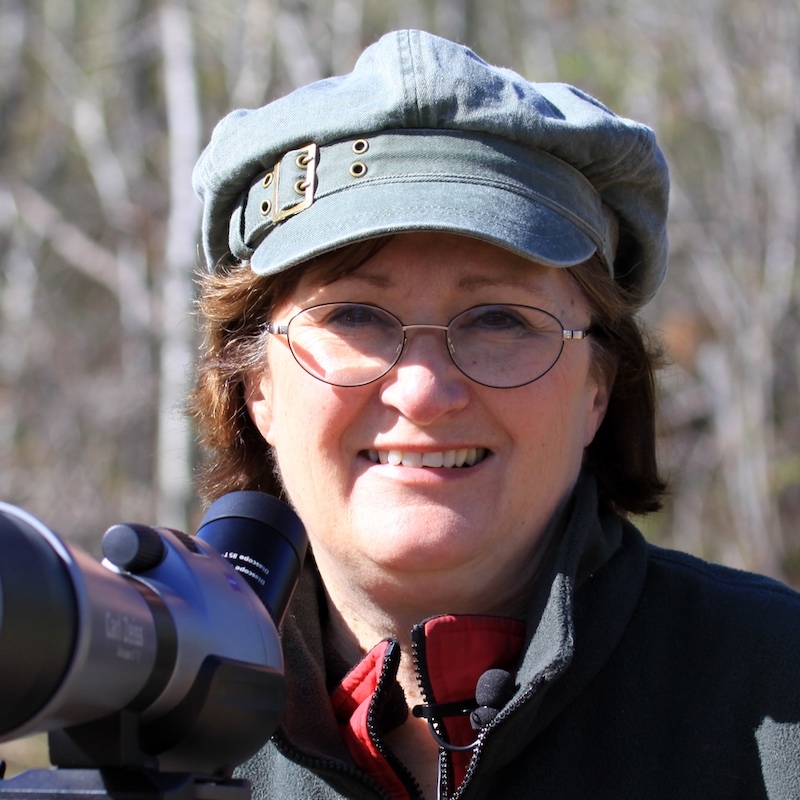 She has written many books about birds and hosts the long-running radio program and podcast “For the Birds.” Her column “Attracting Birds,” about attracting, feeding, sheltering, and understanding the birds in your backyard, appears in every issue of BirdWatching. “Snow Bird,” her first article in the magazine, appeared in December 2003. It described the migration and winter habits of the American Robin. 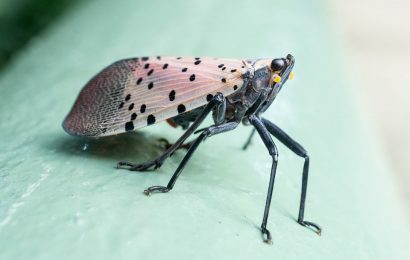 Contributing Editor Julie Craves answers a reader’s question about dealing with invasive insects without putting birds in harm’s way. 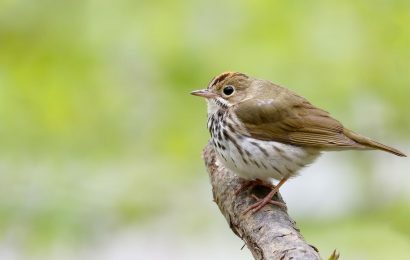 Maps from eBird show where birders spotted Ovenbirds in January and in April. 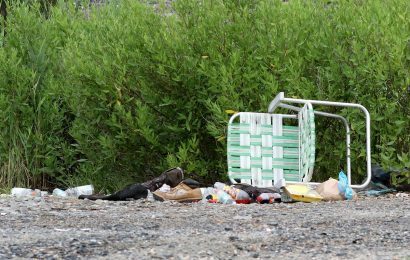 World Migratory Bird Day calls attention to the crisis of plastic pollution.